At the end of last month I shared, as part of New Things November, that I wanted to try making Salted Caramel Candies that I found a recipe for on cincyshopper.com. The pictures of the caramels looked so good that I couldn’t get them out of my head. Well, I was in a hurry to try making them and I jumped in without having everything I needed. I figured a few substitutes would be ok. I used margarine instead of butter and aluminum foil instead of parchment paper. 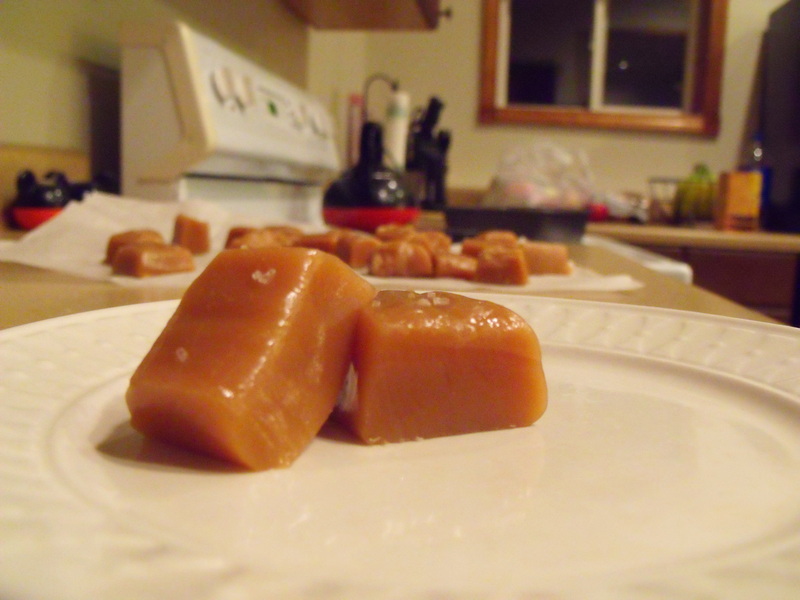 The process seemed to go well of making the caramel, but then it never hardened up enough to be cut into pieces. I was disappointed because I was hoping to use these as Christmas gifts this year. It still tasted good and my family ate it by the spoonful out of the pan. Last weekend my aunt had a crafting party and I needed to bring a snack with me. I had noticed a recipe for Salted Caramel Sauce so I decided to try making this and bringing some sliced apples to dip in it. Well, the sauce was way too runny and I wasn’t crazy about the taste of it. So, I decided this week that I was going to give the caramel candies one last shot. The pictures I had saw of these candies looked so good and I really wanted the recipe to work for me. This time I followed the recipe EXACTLY. I used unsalted butter instead of margarine. I bought parchment paper (I think for the first time ever in my 11 years of marriage). I made sure that the candy thermometer was reaching the proper temperatures at the right time. I stuck to each detail and the caramels were delicious! This time the caramel started to harden after 30 minutes and after the four hours it sliced perfectly. I sliced all the caramel and wrapped them in parchment paper (as recommended) to make individual candies. Tried to grab a quick picture while 3 hungry girls waited around for a treat! My family ate these very quickly and I am excited to make more to use as Christmas gifts and to add the recipe to my recipe box. The only change I will make when making them again is to add a little extra sea salt after the first dose at the 30 minute mark. It was good as is, but I thought it could have used a little extra salty taste with the sweet (and I have a huge sweet tooth). Overall, I absolutely recommend this recipe, if you follow the directions as-is!! I am looking forward to homemaking some Christmas caramels this year.